Weblist allows you to bundle Web pages and media and share them using a single url. Unlike most url bundling services, Weblist gives you much more flexibility when it comes to the type of content you can bundle. You do have to register to use Weblist, but it’s free. Start by identifying the topic of your bundle. You can control the display and provide some interactions (i.e., allowing viewers to vote content up or down). Showing items on a page (vs thumbnails) allows viewers to access embedded videos immediately and to see text that you’ve added (vs requiring them to click on a thumbnail to access the content). Although this will make a Weblist longer, it also makes it more engaging. You can also control privacy settings. Making a list private means that the public won’t be able to access a list unless you share its url with them. To create your Weblist, select from the media menu to add content. In addition to bundling Web pages, you can add text, images, documents, and files (e.g., pdfs, PowerPoint files, etc), as well as videos. When you add content, you’ll be prompted to add a short title and a description. 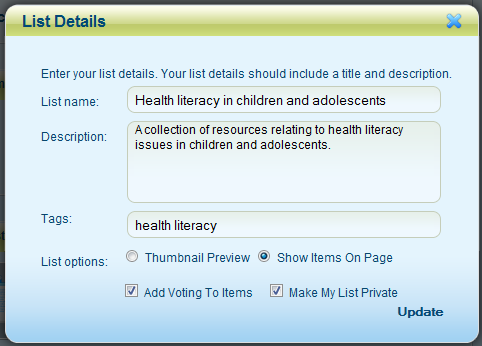 Your content will be added to a panel of list items. This panel gives you access to editing and some basic layout functions. When you’re satisfied, click save and view your Weblist. You can always go back and edit your Weblist if you want to revise descriptions or change the order of the content you’ve added. Weblist is a convenient tool for creating packages of resources for learners. As noted, unlike other bundling tools (e.g., bit.ly and BridgesURL) you have more content options to choose from; however, some of the instructional strategies I’ve described for bit.ly also apply to Weblist. You can use the text option or the description field associated with different types of content to add context to your Weblist, to introduce a problem, and/or to challenge learners with questions or projects (e.g., a Web quest). You can use links to different Web pages to direct learners to discussion forums, chat rooms, quizzes, polls, and other types of interactivity. 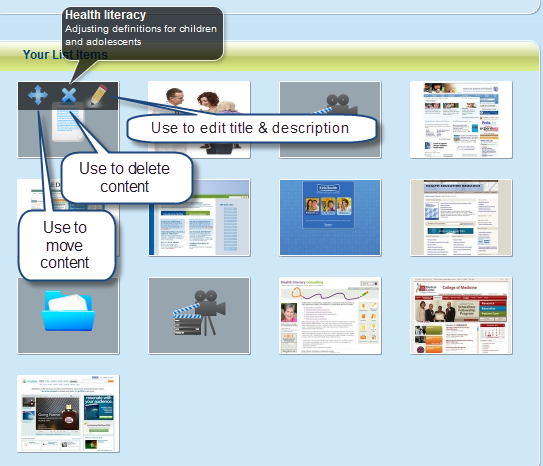 You can also provide interactivity by using file types such as PowerPoint, pdfs, Flash files, etc. Learners can use Weblists to pull content that’s useful to them, although as an instructor you should scaffold content in a way that’s best suited to the learning experience. 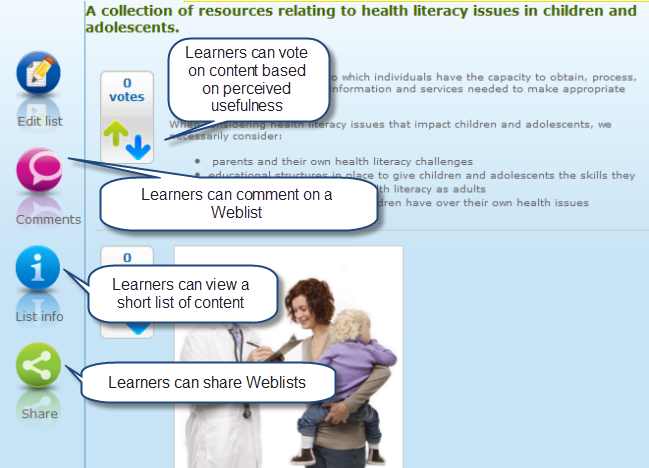 An interesting element of Weblists is that learners can vote on the sequence of content you’ve provided. They can also comment on the Weblist as a whole and if you’ve included documents as part of your Weblist, they gain additional tools (e.g., the ability to highlight and annotate a document). Learners also can use Weblists to create their own collections of resources in response to a challenge you’ve given them. Adding a description to each resource shared requires learners to reflect on how the resources tie together and allows learners to pose questions of their own to fellow learners. Weblist is in alpha, but it’s already quite a useful tool.